The rationale behind Lego-Logic is to design an easily assembled prefabricated classroom module with minimum on site construction. 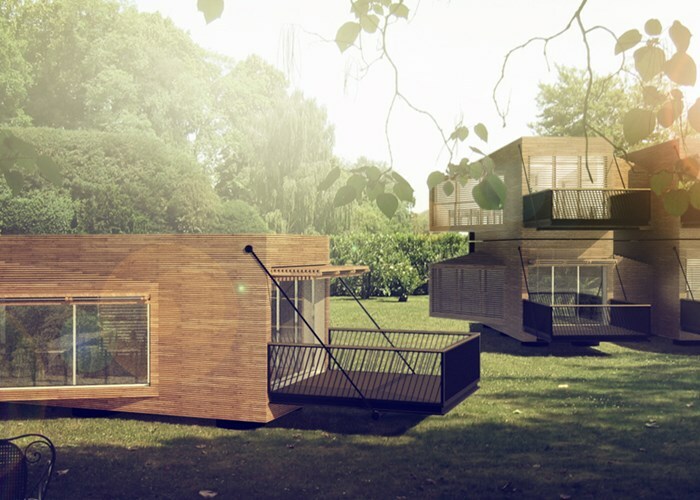 The module is versatile in its site layout for both single storey and multi-storey configurations. The typical module is designed to accommodate 15 students and can be combined with other modules to extend the classroom space incrementally for further 15, 30, 45 students as needed. The single unit, 3500mm wide for ease of transport, once craned into place sits slightly elevated above the ground on inbuilt disc shaped pads that can be adjusted in height according to changes in level on the site terrain. The module is then able to be opened out on all sides with operable elements that are compactly housed within the module during transport. The side elements fold out from the primary rectangular form on a pivot point and lock into place once fully extended. One end of the module can be pulled out like a drawer to extend the core learning space with an entry lobby and locker room while the opposite end becomes an outdoor deck space. A range of options are offered in combination with the basic classroom module as “add-ons”. These include a separate roof element made out of lightweight precast concrete panels and colored twin wall polycarbonate panels that provides a generous catchment for rainwater as well as additional mass for the building thermal capacity.